ONE ONLY - EXCEPTIONAL QUALITY! From our selection of women's "Luxury Designer Leather bags". Fed up with tiny Leather clutch bags with next to no room internally? Well here's the perfect answer! Superb softest quality "Toffee Tan" shade Designer matt Leather extra large clutch bag. 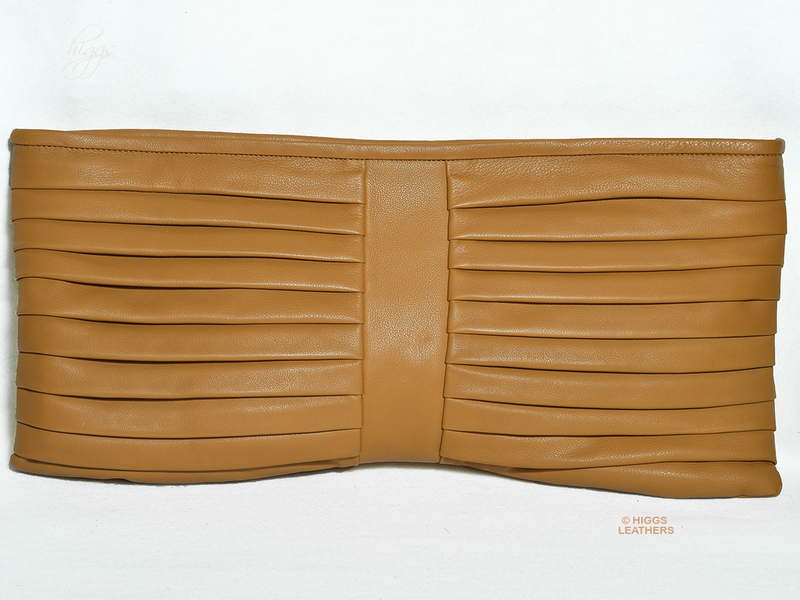 Beautifully pleated to emphasise the softness of the leather. The inside of the bag is one large very spacious section impeccably finished with a high quality matt "Scarlet" shade cotton lining. 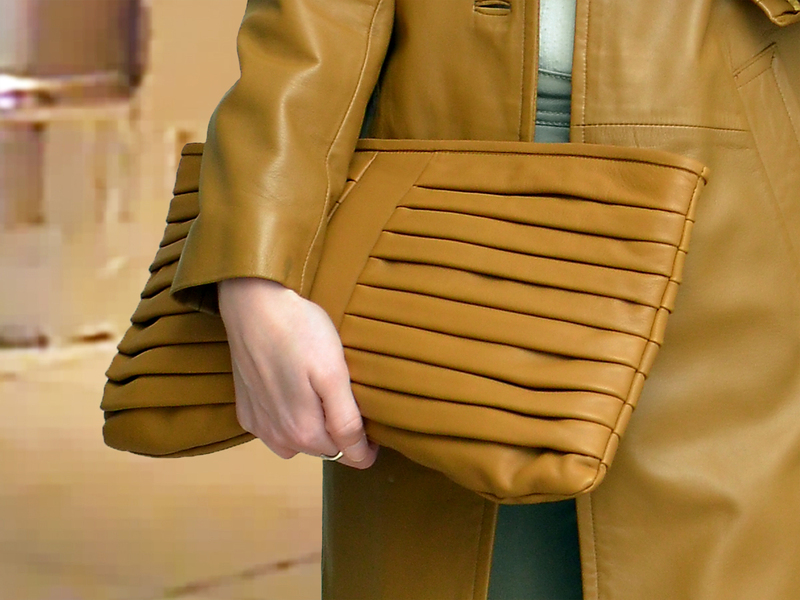 Separate matching "Toffee Tan" shade leather purse with a zip approx. 5" (12.5 cm) wide by 3.75" (9.5 cm) deep. Separate matching small coin and ticket purse with a studded leather flap approx. 3.5" (8 cm) wide by 2.5" (6 cm)deep. 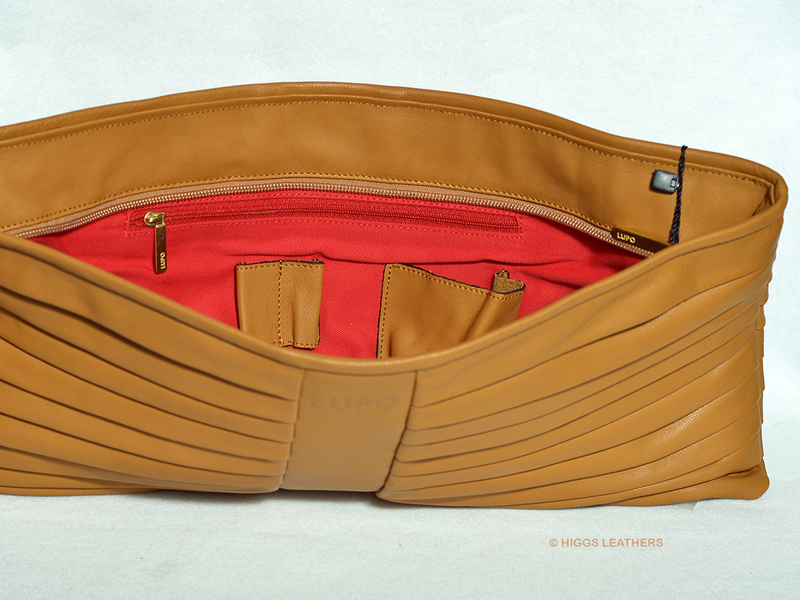 Fixed matching leather "Toffee Tan" shade pocket with a zip approx. 5" (12.5 cm) wide by 4.75" (12 cm) deep. Fixed open top pocket in the Scarlet lining approx. 5" (12.5 cm) wide by 4.75" (12 cm) deep. Fixed pocket in the Scarlet lining with a zip approx. 7.5" (19 cm) wide by 6" (15 cm) deep. Black cloth presentation/storage bag with drawstring top. An outstanding top quality soft leather bag that would make a perfect gift, to be treasured for many years. Deep 10" (25cm) at the base.